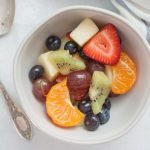 Orange Juice Fresh Fruit Salad is a twist on a classic fruit salad. It’s perfect for serving for brunch, showers, or just as a healthy side dish for dinner! Perfect to customize with whatever fruit you have on hand, too! Peel and chop apples and kiwi. Add all fruit to serving dish. Pour orange juice over fruit and toss. Refrigerate for 30 minutes until serving, optional but recommended! I try to keep an equal ratio of all of the fruits, but feel free to mix it up and include more of your favorite kind of fruit if you’d like! If you don’t have orange juice on hand, you can use fresh squeezed orange juice from one orange, too! If you like your fruit a bit sweeter, you can add a tablespoon of honey or equivalent measurement of the sweetener of your choice (stevia, sugar, etc).